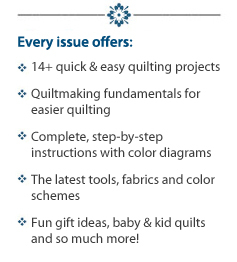 McCall's Quick Quilts - Free Preview Issue! YES! 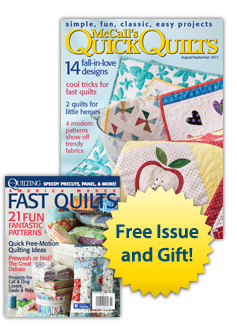 Please send my FREE Preview Issue of McCall's Quick Quilts right away! If I love it and choose to subscribe, I'll get five more great issues (6 in all) for just $16.98 + $3 p&h — a savings of 33% off the newsstand price! If not, I'll write "cancel" on the bill, return it and owe nothing. The FREE issue is mine to keep no matter what! INSTANT GIFT: I'll also receive a FREE bonus issue instantly! A $5.99 value, America Makes Fast Quilts contains patterns for 21 fantastic, fast projects. *Savings based on an annual newsstand price of $29.94. McCall's Quick Quilts is published 6 times a year.